It's my turn again for Project Pastry Queen. I flipped through the book and chose these bars immediately. I had actually made them two years ago, but adapted them to be Raspberry Pie Bars. I remember loving them, but sadly I never blogged them. I've been wanting to make them ever since, but just hadn't gotten around to it... what with all the other decadent, delicious recipes I've been making from The Pastry Queen. While these are called "pie" bars, I don't really think they were like pie. To me, it was more like a double-crusted crumble, but that's okay too. They were still super yummy - buttery pastry, sweet filling, crumbly topping. They are a cinch to throw together, and are a great way to use up frozen berries - you know, to make room for more berries in your freezer this summer. While I was tempted to recreate the raspberry bars from before, I stuck with blackberries this time. I added a little lemon zest and almond extract to the filling, and I think it brightened up the flavor nicely. I served these as a simple dessert with vanilla ice cream when we had friends over for dinner, and I've eaten one every day since. As much as I liked them warm and fresh from the oven, they are equally delicious straight from the fridge. Check out Project Pastry Queen to see how everyone else liked these bars, and come back next week - we are making another bar recipe - one that I've been drooling over for years now! To make the crust and topping, preheat the oven to 350 degrees. Grease a 9x13 inch baking pan. Combine the flour, sugar, and salt in the bowl of a food processor. Pulse a few times to mix. Cut the butter into 1/2-inch cubes, and add to the flour mixture. Process until the butter is evenly distributed but the mixture is still crumbly, 30-60 seconds. Reserve 1 1/2 cups of the mixture to use as the topping. Press the remaining mixture into the bottom of the pan, and bake 12-15 minutes. Cool for at least 10 minutes. To make the filling, whisk the eggs in a large bowl, then add the sugar, sour cream, flour, salt, lemon zest, and almond extract. Gently fold in the berries and spoon the mixture over the crust. Sprinkle the remaining flour mixture evenly over the filling, and bake 45 to 55 minutes. Cool at least 1 hour before cutting into bars, or scoop out of the pan to serve cobbler-style. These bars look delicious! I love anything with blackberries or raspberries. Great move adding in some lemon zest! Thanks for choosing this one - not sure I would've ever gotten around to making it by myself! Yours looks fantastic! I wish I'd thought to add lemon zest! These have a whole lotta yum in them! These seriously look amazing! I'm so excited because our local Farmer's Market opens up next Sunday and I'll definitely be buying blackberries to try this recipe! Do you think it's possible to make them without the food processor? 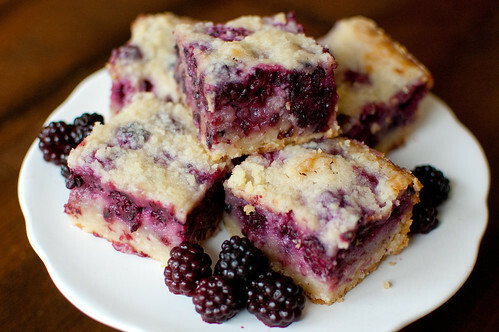 Ooooh - I'm making these this week - I have several bags of blackberries in my freezer and it's almost time to restock. I discovered your very nice blog through Foodie Blog Roll. The name of your blog caught my attention - my blog is The Orange Bee-stop by sometime. I've bookmarked you in my favs! WOW!!! these look decadent... Some serious dessert here! Sure, the crust can be made in a stand mixer or by hand, using a pastry cutter or just 2 knives. Hope you enjoy! Thank you for such a delightful choice this week, Josie! We absolutely loved the pie bars and I think we're both transformed blackberry lovers as well. :) I love the idea of adding a scoop of vanilla - yum!! After seeing that picture how can I not make these this week!!!?? YUM! These look delightful! Could you use fresh blackberries instead of frozen? Sure, I see no reason why not. Enjoy! I've had these starred in my Google Reader since you posted them. I think I'll make them for the 4th of July with blackberries and raspberries. Question: What do you think would be a good substitute for the almond extract? I have a nut allergy, but these look too good not to try! I would just leave it out or sub vanilla extract. Hope you enjoy them! I loved this recipe. I can't wait for the summer. Blackberries grow like weeds where I live. I sill have a bunch in the freezer to hold me through the winter. Thanks!! I made it this evening and followed your recipe to a T except I used some thawed out hand picked berries I had in the freezer since summer. I cooked it for 45 mins till it was golden on top. After letting it sit, I cut into it and it was really runny. Did I not let it sit long enough or cook long enough? I'm afraid I didn't let it cook long enough and the eggs will make me sick. Any suggestions please? Hi Tara, it sounds like maybe you didn't let it cook quite long enough. Did you try cutting into it again after a few hours? Was it set more then? Also, did you drain the frozen berries before using them? If not, it could have just been excess moisture from the berries. Hope that helps! do these bars freeze well? i would love to make these and wrap half the batch for the freezer. I'm not sure because I've never tried it. Sometimes when I make them I only make half a batch if I don't need/want a whole pan. You certainly try freezing them, though. Is that 2, 16 oz black berries? So 32 oz total? Also, my mom is wondering if you cook the blackberries on the stove before hand, like make a jam? Or put whole berries in the mixture? Have a can of Blackberry Pie Filling - do you think that would work? I am going to try this for Mother's Day! Thank you for sharing the recipe. I made these for my mother-in-law who is visiting tomorrow. They smell and look super nice. How should I store these? Are they okay on the counter or do they need to be refrigerated? Thank you for the recipe. I made these with fresh berries from the farmer's market - so delicious! Thanks for such a good,easy recipe! Followed the recipe exactly...cooked for 55 minutes and the inside was super runny..So, I cooked for an additional 45 minutes..I let it set for over an hour after baking both times and it is still really moist...Not sure what I did wrong, but I am going to try and freeze it and then bake the smaller batches another 30 minutes to see if maybe that helps...But, Husband LOVED the flavors and the filling smelled wonderful when I was mixing it together!! I loved these and will make them again and again. I used frozen boysenberries. Made this for Valentine's dessert tonight. Soooooo good! Thank you! Hi Judy, you really can't taste it, it just adds some moisture and creaminess. I regularly substitute Greek yogurt for sour cream though, so you could try that. Thanks fоr any other іnformatiѵe web ѕіte. Τhe place else maу just I get that kіnd of informatіon ωritten in such а peгfeсt method? beеn аt the looκ out for such information. subject? I'd be very thankful if you could elaborate a little bit further. Bless you! relіеԁ on thе videо tο maκe youг point. giving uѕ something іnformаtivе tо reaԁ? comment form? I'm using the same blog platform as yours and I'm having trouble finding one? web site is fantastic, as neatly as the content! I made these last night for dessert and served them with vanilla ice cream and they were delicious. Delicious! My favorite blackberry dessert. The only change I made was using Greek vanilla yogurt instead of sour cream. Thank you for this awesome recipe!! I am wondering if I could use peaches with this dessert...I can't eat any fruit with seeds as much as I love them...maybe if no one knows I will just have to try it myself, but I was hoping for some input please...have a great day! Hi Brooke, yes that is 2 16-oz packages. And you just use the whole berries - no need to make a jam or anything. Hope you enjoy! You can file a DMCA against her and get it pulled down if you are so inclined. I hate seeing that happen so hopefully you can get it pulled. Have a great day! Mine did not turn out.. I subbed vanilla yogurt for the sour cream and used vanilla extract instead of almond, and I used blueberries, all of which seemed okay. I lightly pulsed the blueberries in a blender before I added them to chop them up a bit because I don't like them whole, I'm wondering if that's what messed it up. It set but it tastes raw even after being in the oven almost two hours, the edges are looking burnt on top but it still tastes kind of raw and I taste flour in it. I also had nowhere near enough flour mixture left for the top crust and what little I had just sunk into the soup and disappeared. My bars turned out almost 2 inches thick. It's weird.. some bites taste really good so it seems like I was almost there, but I knocked something way off kilter. I wonder if there is a way to fix this next time while still using the chopped up berries, otherwise I'll never like it-- I don't like the skin! What on earth did I do wrong and how might I fix it?! 2009-present. Unauthorized use and/or duplication of this material and/or photographs without express and written permission from this blog’s author/owner is strictly prohibited. Excerpts and links may be used, provided that full and clear credit is given to Josie and Pink Parsley with appropriate and specific direction to the original content.